I suppose it’s a measure of our different cultural reference points that the column inches devoted to the death of popular musicians can seem out of kilter to me. Pete Burns? My reaction was … who? Leonard Cohen I understand better, and Hallelujah is a fine, much-covered song. It reminds me of a girlfriend who listened to Leonard Cohen when she was feeling low. My advice then and now is it’s better to listen to the Beach Boys: to uplift your mood rather than reinforcing gloom. These two had many column inches, but the passing of Bobby Vee in October 2016 earned just a ‘news in brief’ in my i newspaper. 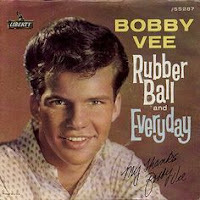 For me, the songs of Bobby Vee are wonderfully typical of the dreamboats-and-petticoats pre-Beatles era. He had a light, effortless tenor voice, with every word completely clear – which served to enhance the vocal tricks on non-words like the ‘Oh oh yea yea’ on More Than I Can Say and how he sings ‘you’ and ‘ee’ on Rubber Ball (you have to listen to get these). It sounds so easy when he sings. It isn’t – I’ve tried! remains a lyric that tugs on the heart strings. Bobby Vee was diagnosed with Alzheimer’s disease in 2011 and, according to Wikipedia, he died from complications related to Alzheimer’s disease in 2016.